Chipotle isn't having a very joyous National Avocado Day. Just when it seemed like the company had moved past its illness epidemic, at least two people reported getting sick after eating at a location in Ohio. 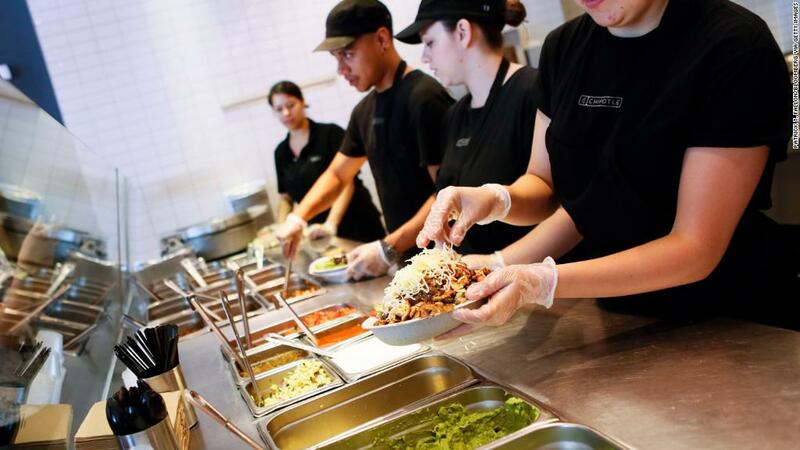 Chipotle stock fell more than 6% on Tuesday. Chipotle told CNNMoney that it shut down the restaurant, in the Columbus suburb of Powell, as a precaution but hoped to reopen it later in the day. The company said it was working with local health officials. Chipotle (CMG) has suffered a series of health scares in recent years. The most serious was an E. coli outbreak in 2015 that sickened 60 customers in 14 states. But the company won customers back. Sales are rising under new CEO Brian Niccol, who has focused on shortening wait times, improving digital operations and introducing new menu items. The stock has been a Wall Street darling.